PennsylvAsia: "Bridging the Parallel: Prospects for Peace in the Korean Peninsula" public policy discussion, January 16. 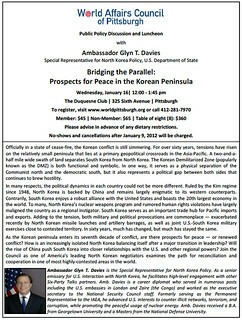 "Bridging the Parallel: Prospects for Peace in the Korean Peninsula" public policy discussion, January 16. As the Korean peninsula enters its seventh decade of conflict, are there prospects for peace — or renewed conflict? How is an increasingly isolated North Korea balancing itself after a major transition in leadership? Will the rise of China push South Korea into closer relationships with the U.S. and other regional powers? Join the Council as one of America’s leading North Korean negotiators examines the path for reconciliation and cooperation in one of most highly-contested areas in the world. The talk and luncheon run from 12:00 to 1:45 pm at The Duquesne Club downtown (map). Registration is required and the cost is $65 for those not members of the World Affairs Council and who don't have to work Wednesday afternoon.